Place bulgur in large heatproof bowl. Pour boiling water over bulgur; stir. Let stand about 1 hour or until water is absorbed. Stir in orange juice, oil, cucumber, onion, cranberries, parsley, mint, orange peel and salt; toss well. Cover; refrigerate 2 to 3 hours or until well chilled. 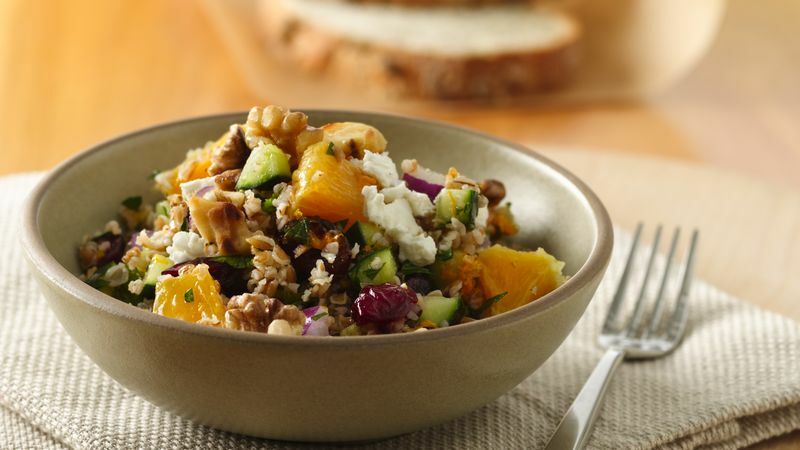 Just before serving, stir in chopped orange; sprinkle with walnuts and feta cheese. Bulgur is wheat kernels that have been steamed, dried and crushed. Store bulgur tightly covered in the refrigerator or freezer. Toasting intensifies the flavor of the nuts. To toast them, sprinkle in an ungreased heavy skillet. Cook over medium heat 5 to 7 minutes, stirring frequently until almonds begin to brown, then stirring constantly until almonds are light brown. Substitute crumbled goat cheese for the feta, if desired.